The Nokia Lumia 1520 is the first Windows Phone 8 phablet (alongside the mid-range Lumia 1320) and the take advantage of the newly extended hardware support of the WP devices. We are of course talking about the upped resolution cap and the extended choice of chipsets. The Nokia Lumia 1520 is on par with the best Android-land has to offer – a 1080p screen and a Qualcomm Snapdragon 800 chipset with 2GB of RAM. But we’ll leave the hardware specs talk for the upcoming preview, the more important part is the user experience. Nokia’s phablet is relatively thin (8.7mm), it’s made of nice polycarbonate (matte or glossy, depending on the color) and it’s not huge – it’s marginally smaller than an HTC One Max, despite having a slightly bigger screen. That’s not to say the Lumia 1520 is a small device, it isn’t. But Nokia managed to cram a lot of cool tech in it – wireless charging is built-in and there’s optical image stabilization, things that are usually found only on thicker devices. Besides OIS, the camera brings a proper PureView experience – the 1/2.5″ sensor is relatively big (bigger than 1/3″ sensors in most phones, smaller than the 1/2.3″ sensor in the Sony Xperia Z1) and its 20MP resolution allows it to do lossless digital zoom like we’ve seen on the Nokia 808 PureView and Lumia 1020 before. Quality ZEISS lens and dual-LED flash (although no xenon) are also a plus. Camera aside, the Nokia Lumia 1520 runs the latest incarnation of Windows Phone 8 – it has the GDR3 update and the proprietary Nokia Black update. Unfortunately, the OS is still behind in usability compared to Android and iOS – there are no notification areas with quick toggles, no way to organize your apps other than the plain alphabetic list, nothing over current WP8 devices other than more Live Tiles per row and an X to close apps. 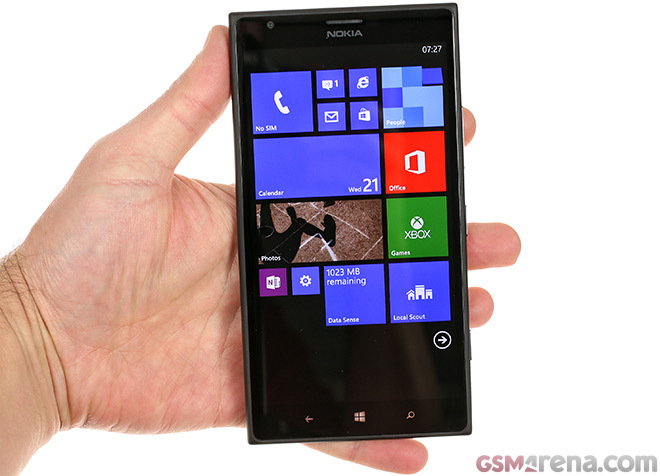 Has WP8 been stretched too far on a 6″ screen? Or is Windows Phone finally ready to take on Android flagships (Microsoft’s platform is strong mostly in the low-end right now)? We’ll have an initial answer for that in our preview.